Indie author Kim Lambert lifts the lid on podcasts as a time-efficient and effective means for indie authors to reach new readers and established fans, drawing on her own experience. Though she’s writing from Australia, her advice applies wherever in the world you are writing. Almost every author I know hates marketing . We’d love just to write, and have people magically find and buy our books. But it just doesn’t work that way. If we want to sell books, we need to do some marketing. The most effective form of marketing is the kind where you become visible to people, without it being a direct advertisement. What do I mean by that? Let’s look at that a bit. Direct advertisement is things like Facebook ads, Amazon ads, email book bargain newsletters etc – things that are, pretty simply a case of ‘buy this’. Indirect advertisement is things like people seeing you on social media, or in a magazine or newspaper article, or hearing you in a radio or podcast interview – it’s all about them noticing you, becoming interested in what you have to say, and deciding that, if you are interesting, your book might be worth buying. Engaging with people, in a way that feels personal, will, in the end, get you lots more sales. But, unless you have absolutely nothing else to do with your days, some of those approaches can be impossibly time-consuming. Actively engaging in many social media platforms comes to mind there. And getting journalists to write you up in their publications can also be difficult. Which brings us to podcast/radio interviews. 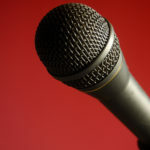 Why Podcast (or Radio) Interviews? The line between ‘podcast’ and ‘radio’ has become vanishingly thin, with the advent of internet radio stations, so I am going to treat them as effectively the same thing here. The reason that these are the best way to get yourself publicity is simple. They are immediate – they are live people, talking to each other. Most of them air an episode every week, some even every day. So the hosts of these shows are always looking for new people to have as guests on their show. Their audience expects a new person, live (or a recording of an interview done live) every single episode. Which is great for you. There are, literally, hundreds of thousands of podcast shows out there, based all over the world. Authors are popular guests, as long as their book topic/genre, or their personal experience, aligns with the theme for the show. Best of all, that interview will be out there, pretty much forever. You will usually be given a recording of it for your own use too, so you can post about it on your FB, put it on your website or your YouTube, and generally get multiple lots of publicity out of it. And all it takes is an hour or less of your time, chatting to someone over Skype, Zoom or the phone. You don’t have to appear on screen – these are almost universally audio only, so, if you’re shy (or you’re being interviewed as your pen name…. no one need see you. Use services like JustReachOut.io – which costs you a monthly fee, but has put together the directory of influencers and interviewers for you, so that you only have to contact them. Use services like RadioGuestList.com and InterviewGuestsDirectory.com – the first is a site where interviewers list the type of people that they would like to interview, the second is where you list yourself as available for interview. By far the most successful for me have been RadioGuestList.com and InterviewGuestsDirectory.com. As a potential interviewee, you go to the site, and trawl through all of the requests, until you find one you like, and respond to them at the contact info provided. No cost to you, unless you want to have your info emailed out to their list as a ‘featured expert’ – that service has a fee. It’s a good site, and many of the people looking to interview are running shows that interview only authors, so there is a lot of potential. Shows may be run from anywhere in the world, and many have big global audiences. It can still be quite time-consuming, because you still have to look through all the listings, then reply to the ones that seem like a good fit. 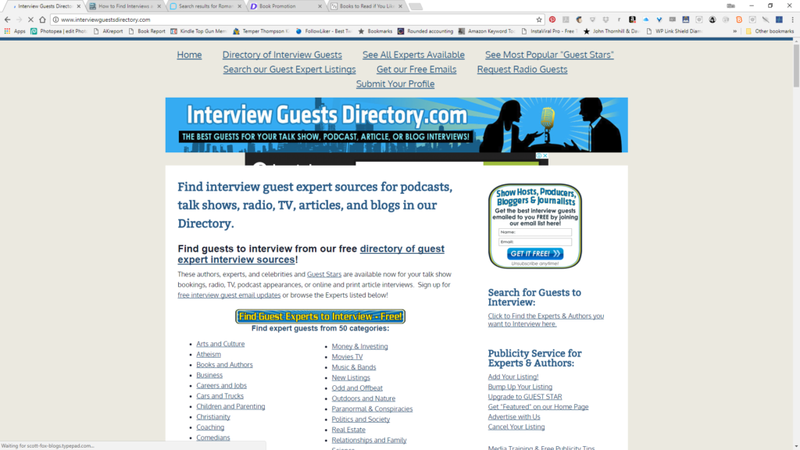 InterviewGuestsDirectory.com – established in 2014 in direct response to requests from many of the people who had been applying for interviews through RadioGuestList. Potential interviewees wanted an easier way to connect with interviewers. It is a directory of people who are available to be interviewed. You create a profile for free (for the first month, so that you can trial it) and choose two categories to be listed in. People who want to interview you contact you, using the contact method you put in your profile. That makes it fantastically easy – you never have to chase anyone – they come to you. You never waste time emailing or messaging people who aren’t interested. After that first month it costs $5.95 a month, or you can upscale your profile and add a photo, and five or more categories, but you never pay more than $10.95 a month. An absolute bargain, just for the time it saves you. I started getting requests for an interview within days of my listing going live. Now, nearly three years later, I still get requests every month. I pay about $9.95 a month, and I just wait for the show hosts to email me. Every so often, the site will bump my listing back to the top of the category, for free. I have consistently been in their top twenty most popular guests (I am currently number 10 in that list). There are, at any one time, over a hundred possible interview guests listed on the site. This is a place where you can stand out and be found. Thousands of possible interviewers use the site, yet very few authors have discovered it as a place to promote themselves. I have had more than 20 interviews as a direct result of my profile on the site – all without me having to do anything to get them, after having put up that profile. The more different things you can talk about, the more interviewers you will appeal to, and the more listeners (possible readers) you will be able to connect to. Most interviewers will give you a chance, at the end of the interview, to deliver a quick pitch for your book, or your website – so be ready to do that. OVER TO YOU Do you have podcast or radio experience that you’d like to share? Like to ask Kim any questions? Join the conversation via the comments box! 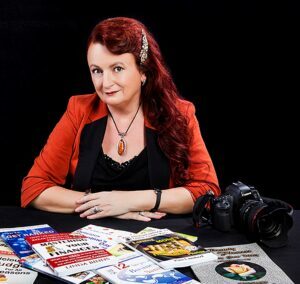 Kim Lambert is an Amazon Bestselling Author, Motivational Speaker, Photographer, Writing and Publishing Coach, and a Travel Writer - more information is on Kim Lambert's Amazon page. She is also the owner of Dreamstone Publishing . Kim is the creator of the Product Creation Launchpad course and the Zero to Book 3 day writing course. Her most recent book is “Writing Tips and Tricks – More than 40 Ways to Improve YOUR Writing Today”. Indie Authors: Are We Ready for Self-Publishing 3.0? Part 1.